Anyone who has read my blog at all knows that we are a family of science geeks. Right now, I have children studying physics, astronomy, biology, zoology... and, thanks to this review, Marine Biology. If there is a field of science that won't intrigue at least one of us, well, we haven't found it. Someone (or usually, everyone) is pretty fascinated by everything science-y. We live in Colorado, though, so some things are a bit difficult to study. Like ocean critters. This fall, though, we have had the chance to try out Bridgeway Academy and their Homeschool Learning Labs, and that was an easy decision. Marine Biology? For middle school? Oh, yeah. Sign Thomas up now, please. We signed up, as we have all of that. Unfortunately, we discovered that we don't have all of that on the same computer. Our computers with the webcam and microphone capabilities will not run current Java apps. The computers that are up-to-date software-wise don't have a webcam, and the microphone simply will not work there either. However, Thomas still had a very successful class. He just had to type any responses into the text chat, as he could not talk. Jigsaw Meetings was fairly easy to use, and we were very happy with the format. What was covered in the class? The course started with some introductory material about Marine Biology, and then it covered different types of animals: Osteichthyes, Chondrichthyes, Invertebrates, Mammals, and Sea Turtles. The final two lessons are on various ecosystems, and the kids had a chance to vote on which ecosystems they wanted to cover. Our class is covering coral seas and the arctic. From class - you can see Mrs. Berg in the top corner, and various other screens as well. How it works. Each week, class meets in the Jigsaw Meeting platform. 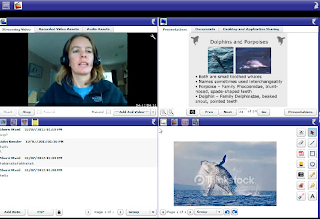 Carla Berg, the instructor, switches around between powerpoint presentations, whiteboard drawings, chat, and even sending the kids off to watch a video on the internet. After the one-hour class, the kids have homework of some sort. We were told to expect about an hour of project-oriented homework, plus weekly reading. In reality, the homework typically took Thomas a lot longer (3-4 hours). The assignments are generally uploaded through the course website. What we thought. The class was great. Mrs. Berg is clearly very knowledgeable about Marine Biology and she put together some interesting projects for the kids. I really appreciated that most of the projects did involve the kids having to do some research on their own, not just regurgitating what they had been told in class. 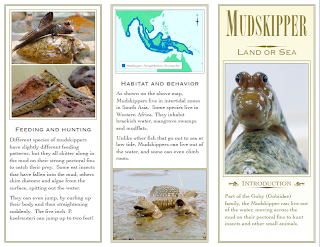 We made extensive use of some of the research materials available to patrons of our library district. I was impressed, as I didn't know Thomas could put something like this together! One thing I didn't appreciate was that in one class, she berated the kids about typos after an assignment that involved a whole lot of rather difficult phylum names (words like Cnidaria, Echinodermata, and Ctenophora) and how there really is no excuse for mistyping a word when it is right there in front of you. My hang-up with that lecture? (Besides the fact that my dyslexic kiddos have a really tough time with spelling normal English words, much less phylum names?) She typed one of the answers wrong (the "correct" answer was "Poriferea" instead of "Porifera") so in order to get it right, the kids had to figure out the typo she made. That question, however, was worth one point, and really was not a huge deal. It really bothered Thomas though, that he couldn't figure out the correct answer. 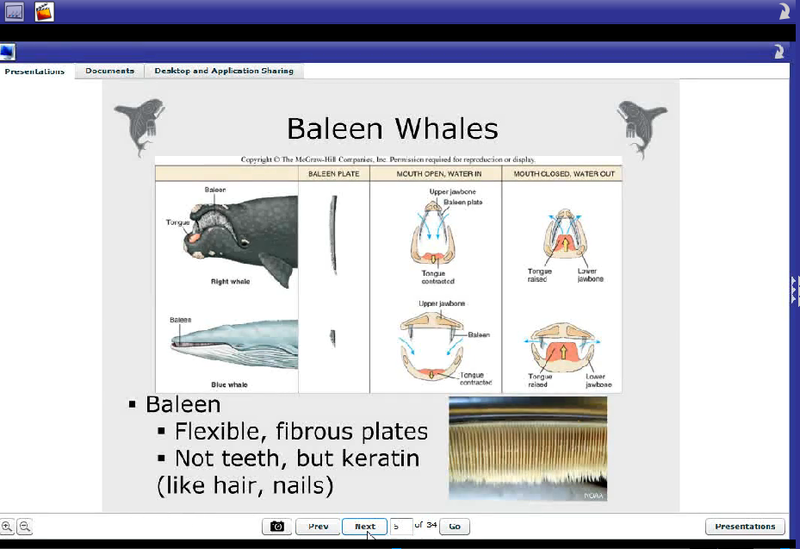 I didn't go looking it up elsewhere, just in the class lectures, but in class it was clearly stated that sharks have 5-7 gill slits per side, not 5-7 gill slits. 5-7 pairs of gill slits, sure. Again, this was only a point, and both Thomas and I know he got it right, so it isn't a huge deal. But if I were paying for the class, I would expect the teacher to actually be looking at the "wrong" answers and giving credit where credit is due. Overall, Thomas really enjoyed the classes. Though he griped about almost all of the homework assignments, once he got started he really did enjoy most of them. I love that you can go back through the powerpoints, or even re-watch a class. We missed one class because we were stuck on I-70 in a dust storm, so being able to view that at Grandma and Grandpa's was really nice. This 9-week course is available for $145, which works out to $16 per class session. That puts it out of reach for some, I know. The nice part is that there were no additional books needed -- at least not specific ones. Having the ability to do general research was required, and if you aren't comfortable with your kids researching online, you'd need some good reference-types of books from the library maybe. This class will be offered again in the spring, and it really was fascinating.